Our family-run Bed and Breakfast is located in a quiet, sunny area in the centre of La Villa. We offer accommodation and breakfast and apartments for 2 to 4 people. A large garden with green lawns and luxuriant trees, surrounded by the spectacular peaks of the Dolomites, UNESCO world natural heritage site. Our location is extremely convenient for a holiday, both in summer and winter. 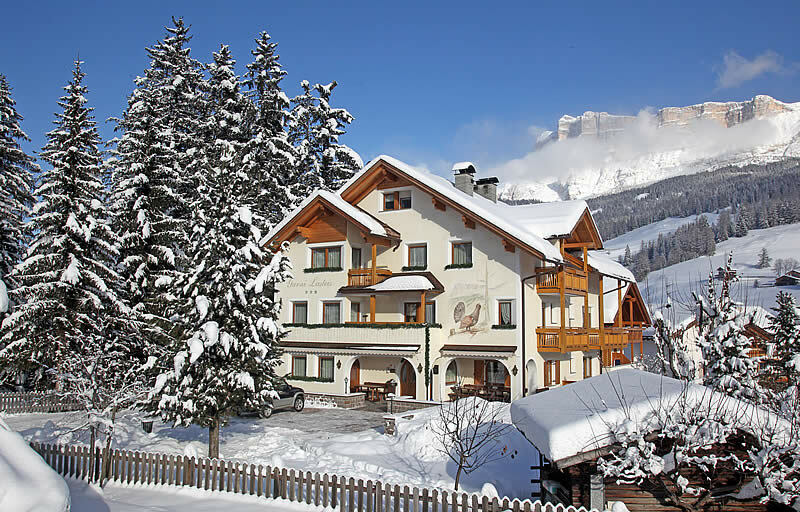 We are located close to the ski slopes and the ski lifts. Also, nearby you will find all the services that the village of La Villa offers, such as shops, restaurants, bars, pizzerias, sports facilities, and many walking trails for natural excursions. Our establishment is completely immersed in nature and offers an enchanting view of Mount Sasso Croce. 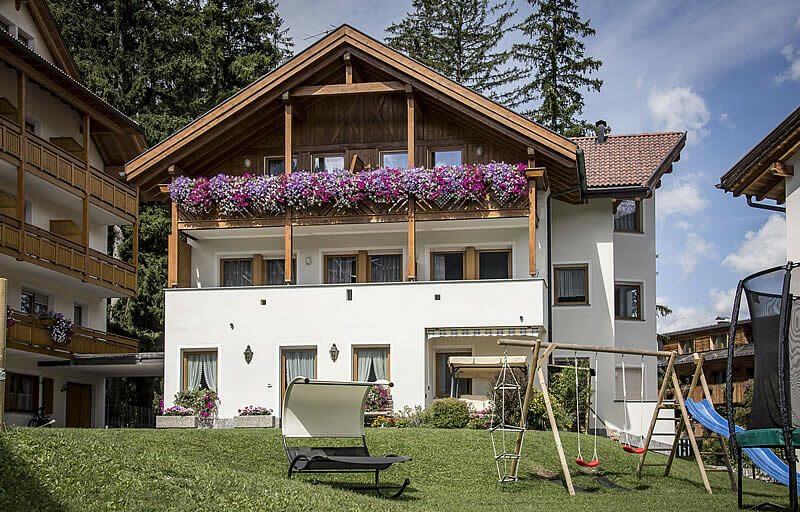 Lasteis Bed & Breakfast offers apartments and rooms with a spacious breakfast hall, a TV room, ski storage with ski boot dryer and wi-fi internet connection in all areas. We also offer our guests a private uncovered car park and a large garden with deckchairs and a playground for children. Within walking distance, you will find the public park for the entertainment of your children. Lasteis apartments can accommodate 2 to 4 people and are fully furnished to offer you pleasant stays. On request, we offer breakfast at Lasteis Bed & Breakfast. We offer our guests a private uncovered car park and a large garden with deckchairs and a playground for children. Within walking distance, you will find the public park for the entertainment of your children. Free private ski bus service to the ski lifts (winter only) included in the price. Bus stop in front of our building (32 yd). Breakfast service included in the price of rooms and on request for the apartments. Freshly baked bread available in the morning on request. On request we offer a “freshly baked bread in the morning” service for the apartments (cost of bread not included). Ski storage with ski boot dryer available for our guests (winter only). You can purchase your ski pass online from home. We will collect it for you in the local ski pass store and you will find it at our hotel upon arrival at no extra cost. In addition to the playground that we have in our garden, within easy reach you will find a very good public playground for the entertainment of your children. We accept payment by debit card, credit card (Mastercard, Visa, Cartasí) and bank transfer. Bicycle lovers can use our bicycle storage. Large private uncovered car park for all our guests. Washing machine available to our guests for a fee. All areas at our facilities have free wi-fi internet connection. Very well furnished and practical apartment with dishwasher, microwave, two TVs, large terrace with view of the Conturines mountain group, wooden beds and furniture, in a very convenient location near the town centre and shops but at the same time away from the main road and traffic. Very friendly and helpful staff. Ideal for families. From our arrival to the end of our holiday, we had a very good relationship with the owners. There was a great family atmosphere. Excellent room and facilities. There is also a lift, car park for cars and motorcycles, storage for skis and bicycles and a garden. Clean and quiet environment. We are always happy to go back there. I spent a week here for my winter holiday and am very happy with the hospitality of this place. Rich and varied breakfast. Cosy rooms. The place was very clean. Staff was friendly and helpful. Roberto N - NaplesA VERY HOSPITABLE B&B! We are staying in this B&B right now and we can only say it is perfect! The apartment looks brand new and is very spacious. The place is warm and cosy! Excellent quality/price ratio! The owners are very friendly and nice! I strongly recommend it!